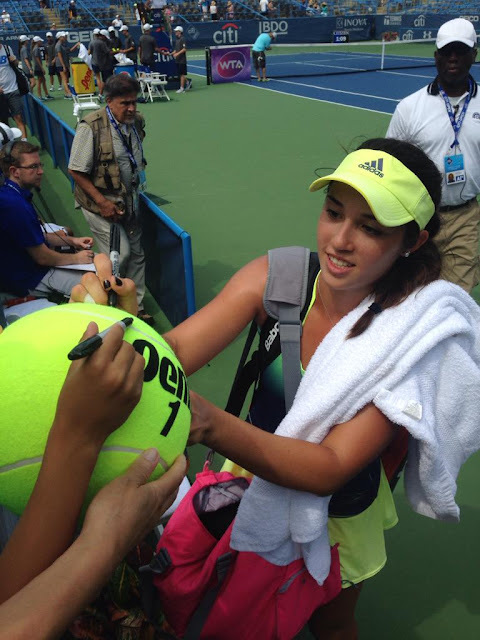 A follow up on the 10 American Teens to Watch in 2015 (WTA). How did the girls do as they tried to transition to the pro tour? 2015 Highlights: The highest ranked American teen on the list, Chirico had a steady rise in 2015. The 19 year old qualified for her first WTA tour event in Acapulco, Mexico and won her first WTA tour match in Washington, defeating Heather Watson and Alize Cornet to reach the quarterfinals. Chirico's title at the $50K Dothan and a runner up finish at the $50K Indian Harbour Beach secured her the USTA French Open wildcard where she made her grand slam debut. The New Yorker also reached the $100K and $125K finals in Midland and Limoges, respectively. 2015 Highlights: Stewart had a great 2015, particularly the first half. The Miami native won three titles ($10K Gainesville, $25K Palm Harbor, and $50K Indian Harbour Beach) on clay. Additionally, she also reached two more $50K finals in Dothan and Charlottesville. However, she struggled a bit and didn't play much on other surfaces. 2015 Highlights: Not a terrible season, but could have been a better season. The UCLA Bruin didn't compete in any pro event until June. Brady went 21-15 for the year with a $25K title in Rock Hill. Also made a final at the $25K El Paso. The 20 year old reached three quarterfinals at the $50K level. 2015 Highlights: A respectable showing for the former Junior No.1 whose schedule was restricted due to her age. Bellis won a $25K in Rancho Santa Fe and reached the quarterfinals at the $50K Sacramento. The 16 year old won two WTA Primer Mandatory matches in Miami before losing to World No.1 Serena Williams. Bellis also reached the final round of qualifying at the US Open, her last match of the season. Due to injuries, she was unable to defend her $25K titles and had fallen out of the Top 200. 2015 Highlights: After briefly entering the Top 100, things went south. The Chicago native struggled with injuries and fitness issues, losing to younger players left and right after returning to the circuit in May. The left hander ended up with a 6-17 record, a forgettable year. 2015 Highlights: An improvement in ranking despite not winning any title. Neel reached the quarterfinals of the $10K Gainesville and $25K Raleigh. The 17 year old took advantage of a QWC and won a round at the WTA Premier in Miami. 2015 Highlights: From no ranking the previous year to Top 650 is a good rise for Kenin. She made her first pro final at the $10K Gainesville. Also reached the quarterfinals of the $25K Florence. A reward for winning the USTA National Championships, the 17 year old received a main draw wildcard into the US Open. 2015 Highlights: Not the progress the Californian had hoped for. In 2015, Gordon qualified into two $25K and two $50K main draws but managed only two wins. 2015 Highlights: Black barely played this season, only seven pro events and three junior tournaments. Perhaps, she had injury bugs. A bright spot for the 17 year old was her runner up finish at the USTA National Championships that garnered her a qualifying wildcard into the US Open Women's draw. 2015 Highlights: An unfortunate season for Dolehide. She played only four pro events before breaking her ankle. Good news, she returned for the Orange Bowl at the end of the year. Take a look at it, if you want (episode 2 on the road). These players are future of tennis and i am sure they make proud all Americans in future. Thanks fro the news and congrats to all of them too. You people can take help from the latest sport news to know about the latest sports going on these days. This can also take help them in making themselves updated about the latest news going on these days. thanks for the blog and congrats to all of u guys.